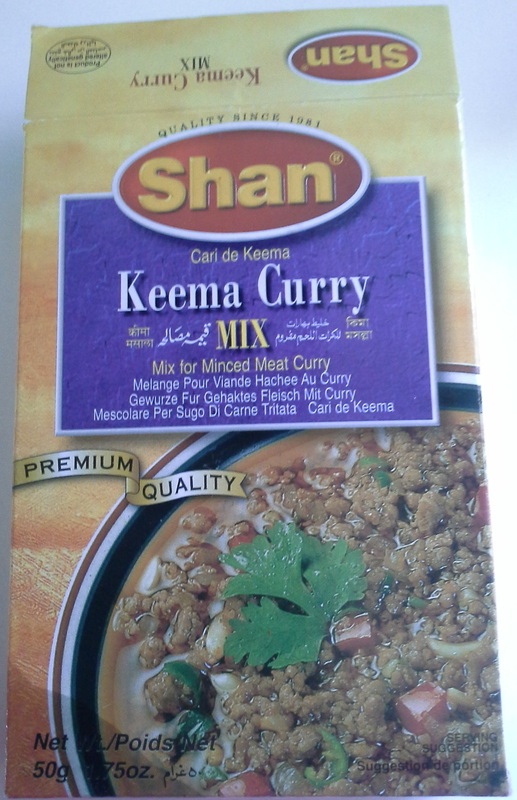 Today we are tackling keema. It is a lovely flavored ground meat, onion and pea mixture that is super easy to pull together. If you can brown hamburger, you can make this. It is a total weeknight dish since all you chop is an onion and you make this all in one dish in less than 20 min. I serve with with parathas and another vegetable. Last week we had Arvind’s favorite baked “fried” eggplant. But that is a recipe for another day. Usually keema is made with ground lamb. If that is not something you can get easily or enjoy, substitute it out for other ground meats. I made it with turkey recently to keep it lean. You might find that chicken or turkey take a little more seasoning because the meat is a little blander, whereas lamb, hamburger or meatloaf mix have a little more umphf to them. Next week I will be covering Bengali egg rolls. Unlike the Chinese food of the same name, these actually have eggs in them. And you can use your leftover keema in your egg rolls. For those of you who love kabobs, we’ll cover keema kabobs later. My apologies that I don’t have pictures of the final dish today. My photographer left for India today and has all sorts of pictures in his camera. I will edit this later to include them, so check back later! 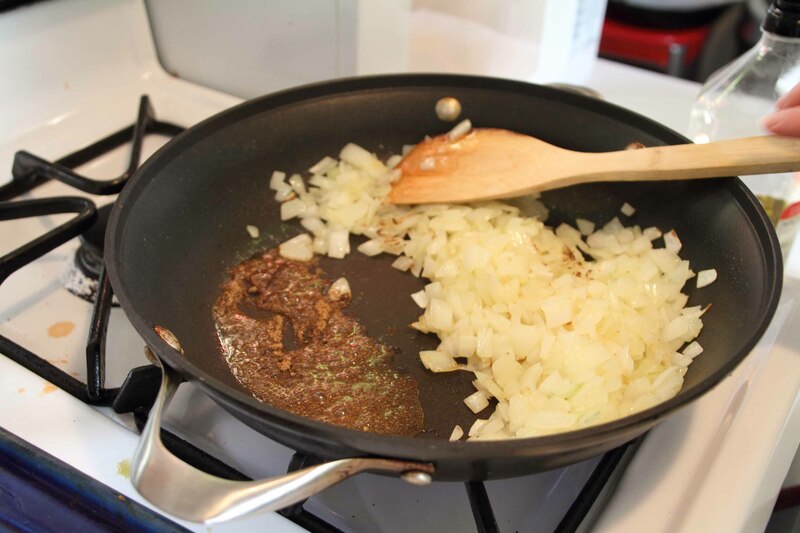 Here is how I carve out a spot for heating up spices before mixing them into fried onions. Heating the spices helps make them taste better. 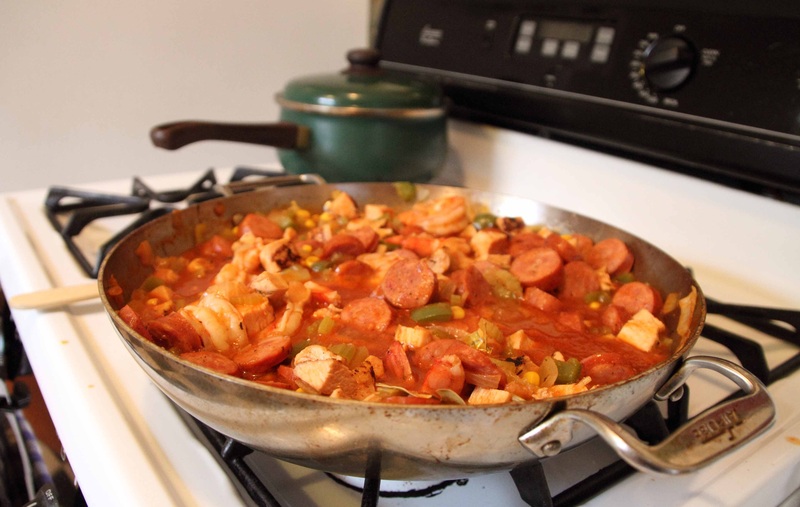 Heat oil in a skillet and mix in onions. Cook until they are just starting to brown. Pull the onions aside to make a small hole in the lowest part of your skillet. (On my stove, it is off to the side because of my crooked house). Add a pinch more oil, then add in the ginger garlic paste. Mash the paste with a wooden spoon to get as much of it touching the skillet as possible. Let the paste heat up a pinch. Mix into onions. Create a new free spot and add a pinch of oil. Add in the keema mix. You can go easy on this and add more later if you don’t add enough. It can get spicy if you do a ton, so go light to start and you can always add more later. Mix the keema spices and oil and let heat until you can smell the spices heating up. Then mix into the onions. 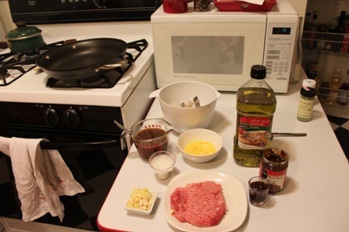 Add in the ground meat. Break up the meat with wood spoon to get small pieces, about the size of peas. Brown the meat. You can stop here if the meat is cooked all the way through. Particularly with lamb, you’ll probably want to keep going because the meat will get more tender with more cooking. Just test the dish to make sure you like how it tastes. If it is too bland, add in more keema seasoning. Add the water and cover. Cook for 5 min. Mix in peas and cover up again. Cook for 5 more minutes. Take the cover off of the pan. Check to see if everything is cooked well. If it is saucy with a thin sauce, mix up the cornstarch/water mixture and add that in as well. The sauce will thicken up. If it isn’t as thick as you’d like, add another round of cornstarch/water. It should be the consistency of taco meat. Taste it and see if you like how it tastes. If it is too bland, add more keema spices. Serve with parathas. Keep the leftovers for egg rolls (coming next week). 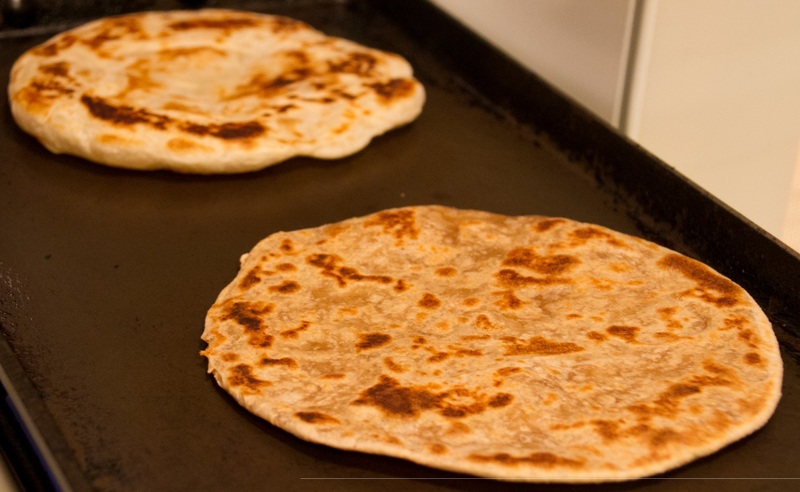 Parathas. For those of you who know what they are, you’re all sighing in contentment. This easy bread is a great way to finish off cooking a meal without having to do any work. 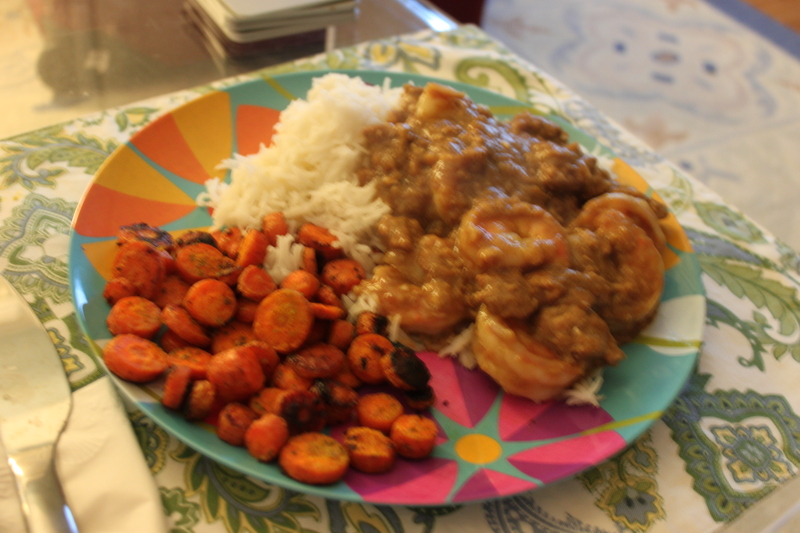 And if you have an Indian husband lurking near your kitchen, you can probably put him to work “making” them for you. I will be using them in other recipes, so I thought I’d dedicate a post to them today so you have the basics in what they are an how to make them. meals. Or, if you are Arvind, they are the meal. The first meal he made me was parathas, Indian pickle (lime chutney, carrot chutney, etc) and shrikhand (a sweet, strained yogurt). Yeah, he went all out. But I was hooked. The puffy consistency pulls you in and they have just enough flavor that they are good on their own, but can also go along with a ton of different dishes. Arvind is a fan of Swedish meatballs and parathas. What is up with the different types? 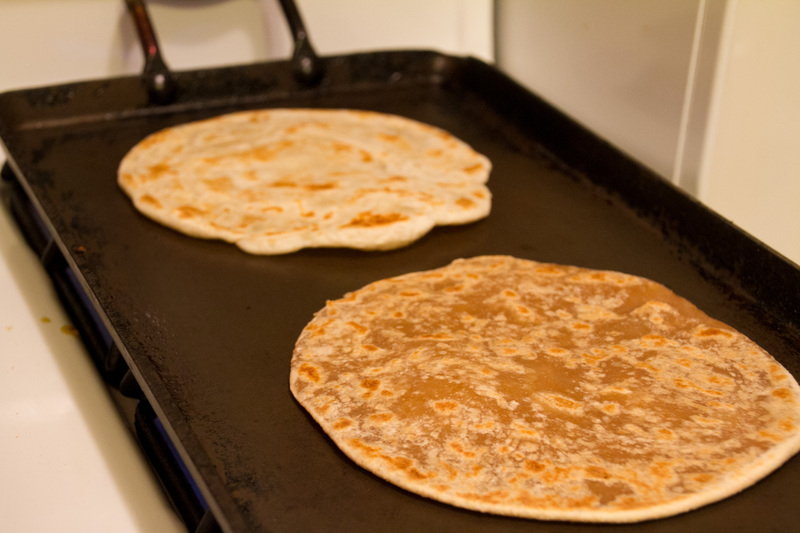 Plain and whole wheat parathas are the basics. they’ll go with anything. But they do make them stuffed with potatoes, cauliflower, onion, or my new favorite – fenugreek (methi). The stuffed ones are a bit more substantial and can be coordinated with your other dishes. How do I make them? This is the easiest part. You will need a non-stick pan. 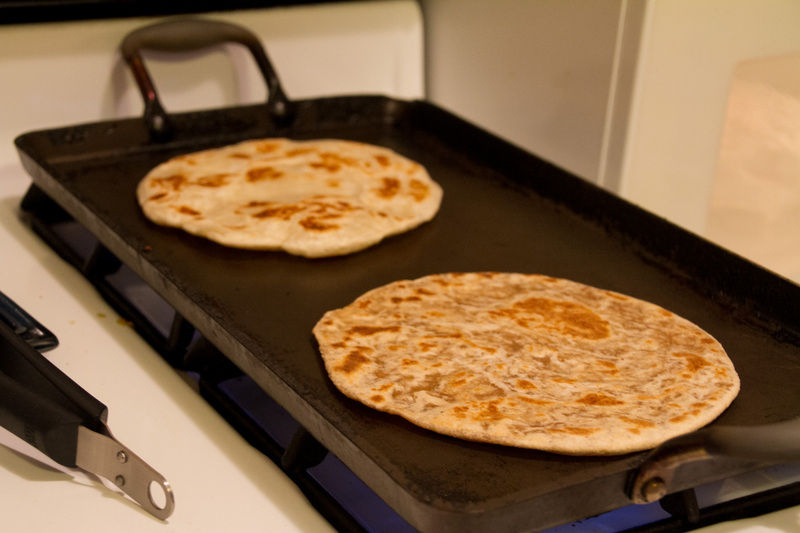 We use a 2-burner griddle (aka “the paratha pan” in our house). That is it. No oil, butter or ghee. Just a pan and some heat. 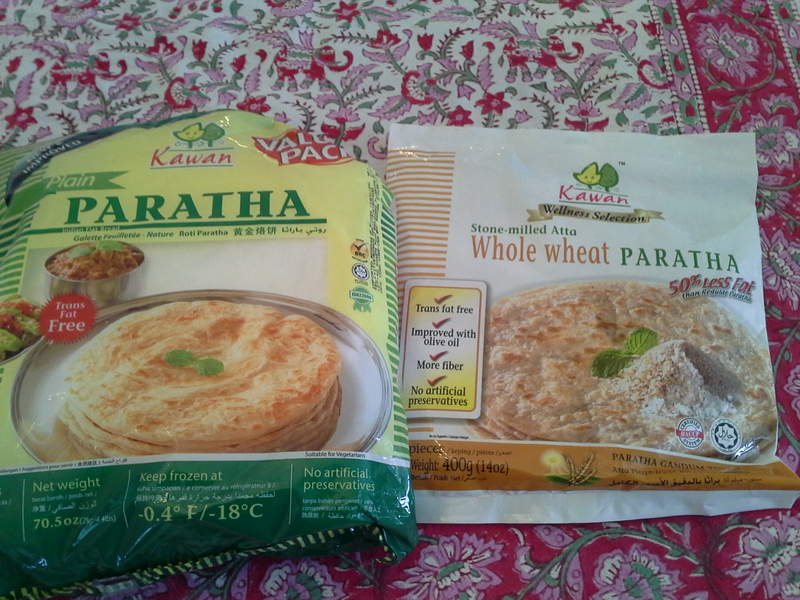 The parathas come in 5 in a pack (or multiple 5-packs in a larger bag). They gave sheets of plastic between them. You take out as many as you want while heating up your pan over medium-high heat. 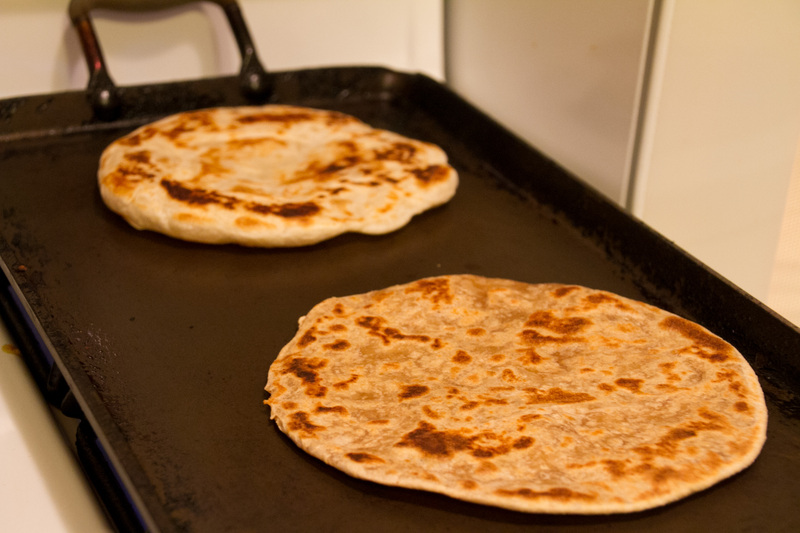 I usually am too impatient for the pan to heat up and as soon as it is warm, I toss on the parathas. They will look like a frozen tortilla. 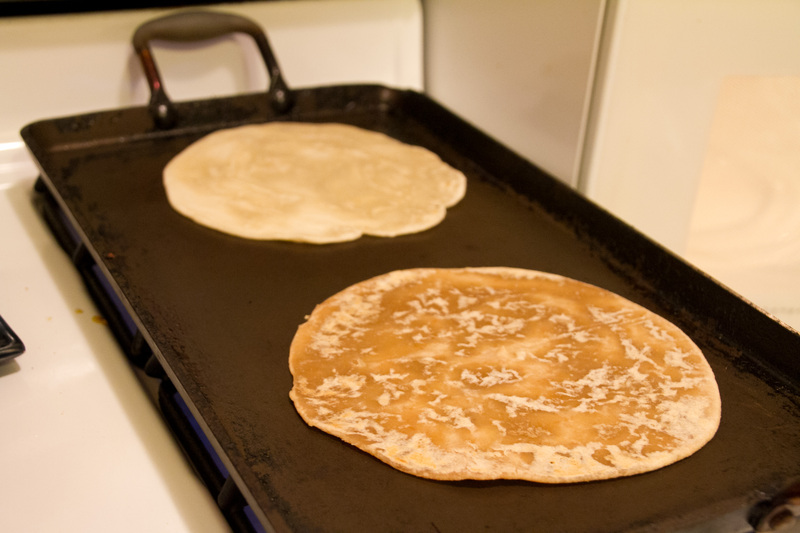 Using thongs, a spatula or wooden spoon, flip the paratha frequently as it melts and then starts to cook. As it gets closer to being done, you’ll see brown spots on it. When it puffs up and has some nice brown spots, you’re done. You can make the next one. 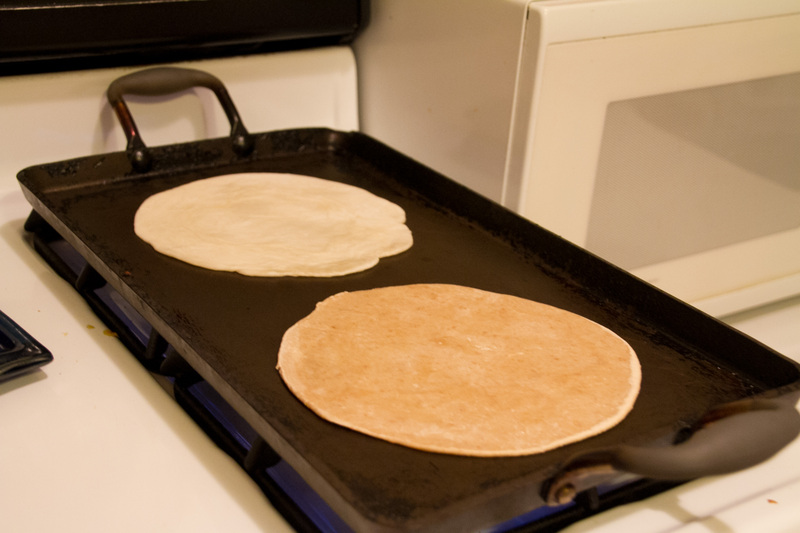 We keep them in a tortilla warmer to keep on the table because you want to keep them nice and warm. They aren’t great reheated. Of course they come from the Indian grocery store. They are in the freezer section. Our freezer section has a bewildering array of them, but the nice thing is that they are pretty risk-free in trying out different flavors, but definitely start with the plain ones to get a feel for them. Click on pictures to make them bigger. Enjoy!